It's couple weeks to Thanksgiving, so what better time to watch some Christmas shows! I was sent a couple of blu-rays to review, Winnie the Pooh: A Very Merry Pooh Year and Mickey's Christmas Carol. I've seen Mickey's Christmas Carol many times so I figured I'd start with Winnie the Pooh, but not being a big fan of Pooh I wasn't too impressed. So I was happy to put in the blu-ray edition of Mickey's Christmas Carol. And it looks pretty good. They did some digital restoration magic but honestly I thought it would've looked better. I understand it's an old cartoon but some of the other restorations Disney has done have been on old cartoons and they looked amazing. This one does look good, but it didn't blow me away. For those of you unfamiliar with Mickey's Christmas Carol, it's Disney's take on Charles Dickens' A Christmas Carol, starring Scrooge McDuck as Ebenezer Scrooge. It's the story of a stingy old man (or in this case, duck) who is taken through his past by ghosts to reflect on his life and see the doomed path he's headed down. It's a wonderful, classic tale that's been adapted very well into the Disney universe. And what's amazing is Mickey's Christmas Carol is only 30 minutes long but it manages to cram the whole story in without feeling cramped. They are enjoyable enough, but it just seems like Disney could have found some other hour long Christmas show to put on, or maybe a couple other half hour shows. There is another bonus feature where sing Christmas songs along with Mickey, but not much more than that. 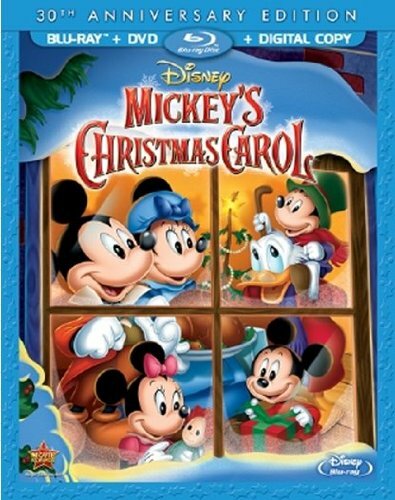 So while I love Mickey's Christmas Carol, I found this release, which contains the blu-ray, DVD, and digital copy, to be a bit lacking. So should you get it? I'd say yeah, but not until the price drops.